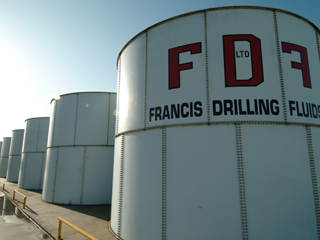 Francis Drilling Fluids, Ltd. is the oldest drilling fluids company on the Gulf Coast. We are here to stay. FDF employees have the longest average tenure of any gulf Coast fluids company and are empowered to satisfy our customers. Our state-of-the-art equipment assist us in maintaining highly qualified and motivated staff members who facilitate superior customer service. We are the industry pacesetter in providing innovative environmental solutions. Our liquid mud storage program is by far the best offered on the Gulf Coast. We utilize the latest communication technology to provide our customers with timely and efficient logistical support. Pride, Safety, and Christian Morals have guided our growth for over 25 years.